LAS VEGAS – World Boxing Association (“WBA”) and International Boxing Association (“IBA”) World Light Heavyweight Champion Beibut Shumenov unloaded a 23-punche explosion on three-time world title challenger Danny “The Bronx Bomber” Santiago in the ninth round, when the fight was stopped by referee Tony Weeks, in tonight’s mainevent that aired live on TeleFutura’s “Sólo Boxeo Tecate” from South Point Hotel Casino in Las Vegas, Nevada. “Fire& Fury” was promoted by KZ Event Productions (the Shumenov brothers –Beibut and Chingis – own and operate the Las Vegas-based KZ Event Productions) in association with Golden Boy Promotions, Don Chargin Productions, GuiltyBoxing and South Point Hotel Casino, and sponsored by Cerveza Tecate and AT&T. 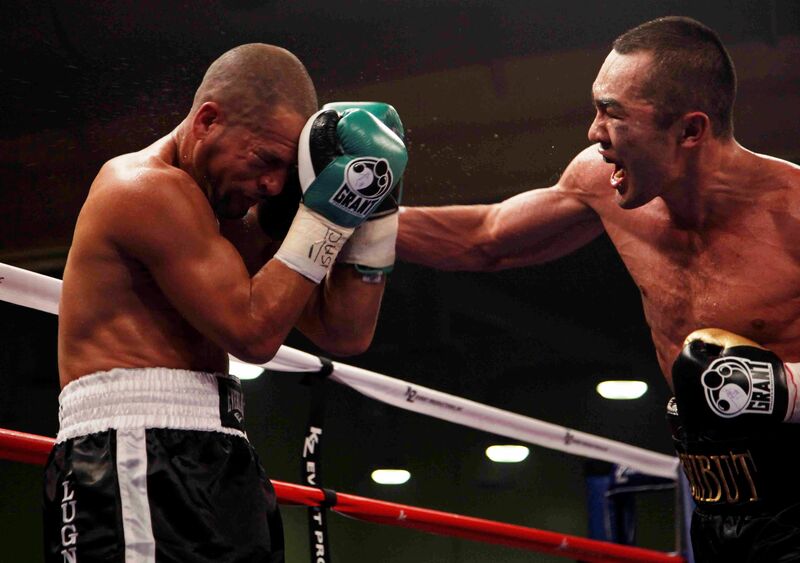 Undefeated WBA FEDALATIN Welterweight Champion Ravshan Hudaynazarov (15-0, 12 KOs), rated No, 9 by the WBA, successfully defended his title belt via a one-sided, unanimous 10-round decision (99-91, 99-91, 98-92) versus Hector “The Hurricane”Munoz (19-6-1, 12 KOs). 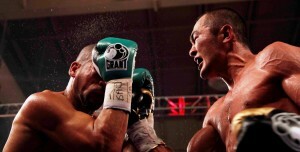 Unbeaten WBA International Light Heavyweight Champion Gayrat Ahmedov (17-0-1, 11 KOs), rated No. 2 by the WBA, used a relentless body attack to pitch a complete shutout, winning all eight rounds (80-72 three times) against Billy Bailey. Hudaynazarov and Ahmedov are both members of KZ Event Productions table. LightweightJuan Suazo (8-4-3, 5 KOs) upset local favorite Ramon Montano(17-10-2) by way of a six-round decision in a war. Exciting Las Vegas super featherweight “Lightning” Lonnie Smith(14-2-2, 10 KOs) scored a win by third-round TKO when Eduardo “Lalo” Arcos(16-5-1, 13 KOs) was unable to continue. Hot super featherweight Joel Diaz (5-0, 4 KOs) remained unbeaten, stopping Esteban“Junglehead” Nichol (3-2, 3 KOs) in the opening round. Russian cruiserweight Medzhid Bektemirov (6-0, 5 KOs) remained undefeated but he had to go the distance for the first time as pro for a win by four-round split decision against Chad “TKO” Davis.